Born Mary Frances Thompson in 1895, Te Ata grew up in the Chickasaw Nation near present-day Tishomingo, Oklahoma. She received her early education in Tishomingo, and eventually went to the Oklahoma College for Women. While there, it was evident Te Ata had a natural talent for drama. Thompson took on the stage name Te Ata, which means “bearer of the morning” in Chickasaw. After school, she worked as a storyteller to finance her acting career. 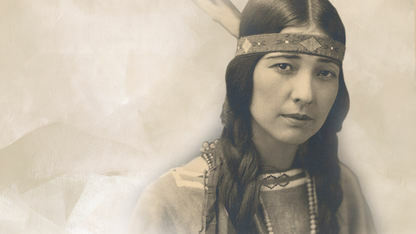 She would tell Chickasaw legends, myths and chants, including performing rituals in native regalia. Te Ata attended the Carnegie Institute of Technology in Pittsburgh, Pennsylvania, for one year. From there, she moved to New York City, where she met and married Clyde Fisher. During the 1930s she performed at summer camps in New York and New England. She then went on to perform at the White House for President Roosevelt, for the king and queen of England, in both England and Scandinavia, and on stages across the United States. Te Ata also worked as a drama instructor and authored several children’s books on the subject of artistic interpretations of Indian folklore. She passed away in 1995 in Oklahoma City.